Is the Waterpik a Good Alternative to Flossing with Braces? We all know that flossing is extremely important for our dental health. Even with this knowledge, most of us often go to bed without ever touching the cracks of our teeth. For parents, it seems impossible to get children to floss. 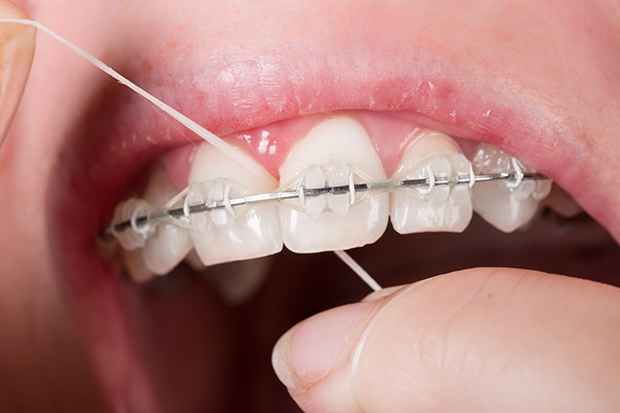 Add braces to the mix, and it can become a serious battle to get them to floss between all the wires and brackets. The struggle is real, and we’re on the lookout for an alternative to flossing. Some parents have asked if they can have their child use a Waterpik as a substitute for flossing. Yes, it’s easier and faster to use than dental floss, and yes, some kids actually think it’s fun. But we must consider the efficacy of the Waterpik to determine if it’s a valid alternative to flossing. How Does the Waterpik Work? One of the most desirable features of the Waterpik is its ease of use; simply place the tip of the Waterpik in your mouth, close your lips, and start flossing! It uses 5-90 psi of water pressure to remove food, tartar, and bacteria that can easily collect along the gums and teeth. Sounds great, but how does it stack up against traditional flossing? How Effective is the Waterpik? The Waterpik claims that it cleans up to 50% more effectively than flossing. We were excited to test it out ourselves. After a typical day of meals, drinks, snacks, and desert, we used the Waterpik as an alternative to our usual flossing habit. We followed with our regular brushing routine, then rinsed vigorously with mouthwash, as we normally would. At first glance, the Waterpik did a pretty good job. The real test came after all was said and done; we revisited the cracks between our teeth with traditional floss. Low and behold, the Waterpik had left some plaque and food debris behind. Hence, we are forced to the conclusion that the Waterpik simply cannot replace traditional floss. Why Use the Waterpik as an Alternative to Flossing? The purpose of this blog is not to completely rule out the Waterpik as part of a healthy oral routine. It does have some great benefits such as its appeal to children and teens as an easy and quick cleaning method. It’s quite effective at removing large food particles, so it’s perfect for flossing braces between meals. If you or your child wants to use a Waterpik, great! Just don’t replace your daily flossing routine with it. As an alternative to flossing, the Waterpik doesn’t stand a chance. Questions About Orthodontics? We have Answers! What is the Right Age for Your Child to Get Braces? Don’t Miss a Thing! Connect with us on Facebook! This entry was posted in Orthodontics and tagged Braces, Flossing, Orthodontics, Waterpik. Bookmark the permalink. Follow any comments here with the RSS feed for this post. Both comments and trackbacks are currently closed.